Delivery times may vary, see cgv contact us before the purchase to have the exact deadlines. By clicking on immediate purchase, the customer certifies having read and accepted the general conditions of sale! Available at the bottom of this. Rear brake disc malossi whoop disc. For scooter yamaha t-max 530. The brake disc last generation very light, stainless and dimensionally stable. The whoop disc have been subjected to numerous tests both in competitions and on inaccessible routes in order to allow malossi technicians to develop a series of discs for the most common vehicles. Malossi discs, in combination with the Malossi range of brake pads, are able to guarantee a progressive and safe braking until the complete stop of the vehicle even after hours of use. Stainless steel disc, laser machining, enhanced and rectified. Defined profile calculated to fully utilize the area of ​​the braking material, discharge dust, evacuate water and sludge during braking. The area of ​​heat dissipation is when doubled to keep low the operating temperature. Yamaha t-max 530 ie 4t lc from 2012 (j409e) rear. The processing time of your order can vary 5 to 15 working days, contact us before the purchase !! anti-theft devices, batteries, spark plugs, chain kits, pinions, crowns, chains, clutch discs, air filters,, oil filters, fuel filters, oils, engine gaskets, spinnaker seals, brake levers and clutch grips, handles, jaws brake, fixed and floating brake discs, brake pads, motorcycle tires, cross and enduro tires, scooter tires, quad tires, inner tubes, lamps and spotlights, wheel bearings and steering bearings, spraychain, turn signals, mirrors, fork tubes, cables, tank caps, handlebars, saddles, bolts, handlebars, valves and stoppers, contactors, workshop saddles, footrests, belts, exhausts, tools, top cases and windshields. Helmets, rain gear, clothing and anti-cold accessories, tire cover, etc. 03.25.55.74.71 Monday to Friday from 9h-12h to 14h-18h. 06.62.69.50.19. 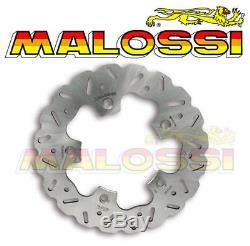 The item "disc brake malossi rear yamaha t-max 530 tmax whoop disc brake" is on sale since Thursday, June 5, 2014. It is in the category "auto, motorcycle parts, accessories \ motorcycle parts \ other". The seller is "misterbike-fr" and is located in saint-dizier, champagne-ardenne. This item can be shipped to the following countries: france, belgium.